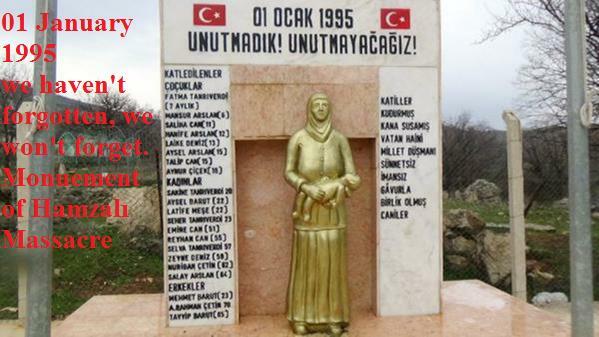 Hamzali Massacre was done and undertaken by Pkk on 01.01.1995. As a result of Pkk attack, 20 civilian villagers – most of them are children and women- were slaughtered wildly. As you can see below with evidences, this barbarous attack was done by Pkk and they boasted of this in their media organ. “KULP HAMZALI VILLAGE MASSACRE (1 JANUARY 1995) PKK EXECUTED 20 CIVILIAN VILLAGERS – MOST OF THEM ARE CHILDREN AND WOMEN- BY FIRING SQUAD. ONLY ONE OF THEM WAS VILLAGE GUARD. —PKK MEDIA ORGAN SERXWEBUN, ISSUE OF JANUARY 1995, PAGE 25. — GUERILLA ATTACK TO VILLAGE OF VILLAGE GUARDS: ABOUT 30 VILLAGE GUARDS AND THEIR RELATIVES WERE KILLED, 15 VILLAGE GUARDS AND THEIR RELATIVES WERE WOUNDED. DURING SKIRMISH WHICH OCCURRED DEPENDED ON THIS ATTACK AND TWO AMBUSH THAT WE DID, MANY SOLDIERS WERE ALSO KILLED AND WOUNDED. “ -> This passage was taken directly from media organ of PKK that calls Serxwebun. 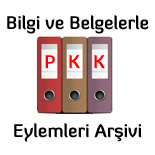 This entry was posted on 22 Aralık 2016 by Pkk Eylemleri Arşivi and tagged hamzali, hdp, ingilizce, kurdis people, massacre, massacre in turkey, Pkk, pkk eylemleri, pkk massacre, tak, turkey, who is pkk, yabancı basında pkk haberleri.